We are open Monday to Friday from 7:30am to 6:00pm, 51 weeks of the year. We care for children from the age of 0 to 14 years old. Sessions are open to children aged 3 to rising 5 years term time only. Treating and respecting each and every child as an individual lies at the heart of Clare House, every child deserves the best possible start in life, and support to fulfil their potential. 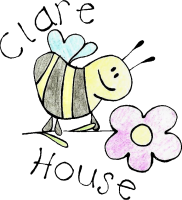 At Clare House we aim to provide a safe, happy and friendly environment where children can develop and grow, fulfil their individual potential and gain a sense of achievement whilst also discovering and mastering new skills in an atmosphere of warmth, care and happiness which will benefit them for the rest of their lives. Provide a happy safe, warm and stimulating environment. Help children to develop responsibility for themselves and their actions, encouraging them to become competent, confident and co- operative individuals. Promote a positive relationship with parents/ carers and work in partnership with them to provide high quality play and care for their children. Enhance the development and education of children under school age. Offer inclusive services that are accessible to all children and families in the community. A program of activities which are interesting, educational, stimulating and fun all planned around your child’s interests. Care and activities that base your child’s needs at the centre. Activities that promote each child’s social, physical, moral and educational development. Access to a variety of facilities and equipment under safe supervised conditions. A key worker system that offers your child with a secure attachment to a key person who will be responsible for your child’s care and promoting their learning and development, this secure relationship will endeavour to enhance your child’s self- esteem and self confidence. Services that meet the conditions of the Children’s Act 1989, 2004, Childcare Act 2006 and all other relevant childcare legislation that may apply. An environment that promotes inclusion and ensures that no form of discrimination takes place. Listening and responding to your/ their views and concerns. Keeping you informed of our policies and procedures, including opening times, fees and charges, and programmes of activities. Sharing and discussing your child’s achievements, experiences, progress and friendships, along with any difficulties that may arise. Home to nursery sharing books are offered alongside reports and parents evenings in order to share your child’s achievements and development. We have a highly experienced staff team that are constantly updating their knowledge through regular training courses. All staff have attained (or are working towards) NVQ 3 in Early Years and/or Playwork or Cache NNEB. Everyone is qualified in First Aid and holds a current certificate in Safeguarding Children. We have a qualified Special Educational Needs Co- ordinator (SENCO) and an Equalities Named Co- ordinator (ENCO) and a fully trained Safe Guarding Officer.